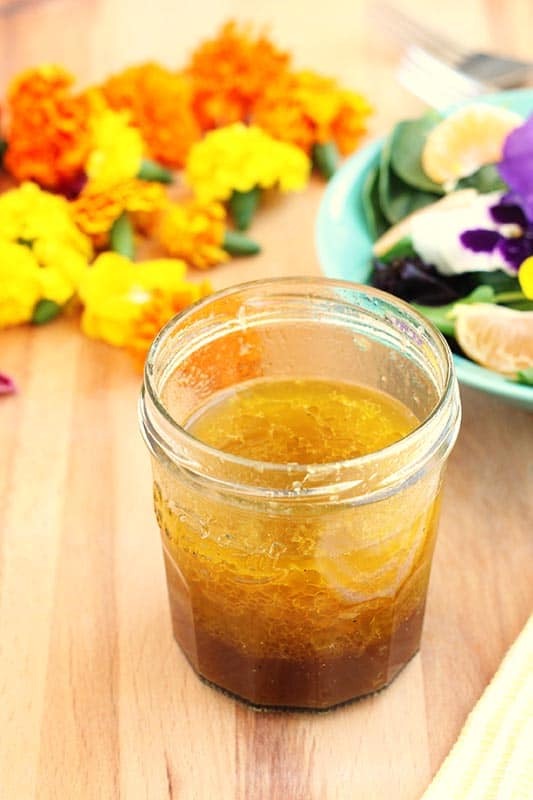 This Tangerine Vinaigrette recipe is made with fresh squeezed tangerine juice, balsamic vinegar, and olive oil. 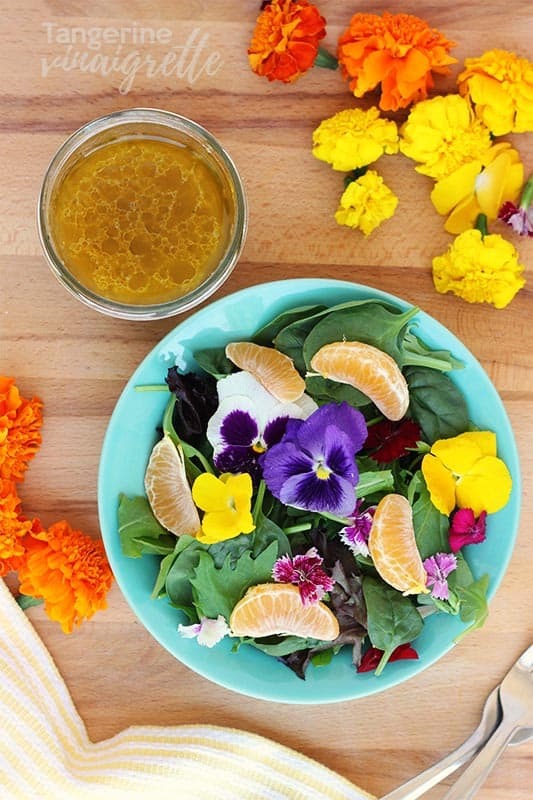 The citrus adds bold flavor to this homemade vinaigrette. Summer brings out this side of me. June-September we pack our menu with salads and load them up with anything and everything. One of our favorite activities as a family is to browse the produce section of our local grocery store and pick something new to try. While searching the fresh herbs I stumbled onto a little gem that I had NO idea existed. Right there, smack dab in between thyme and mint sprigs, were a beautiful display of edible flowers. 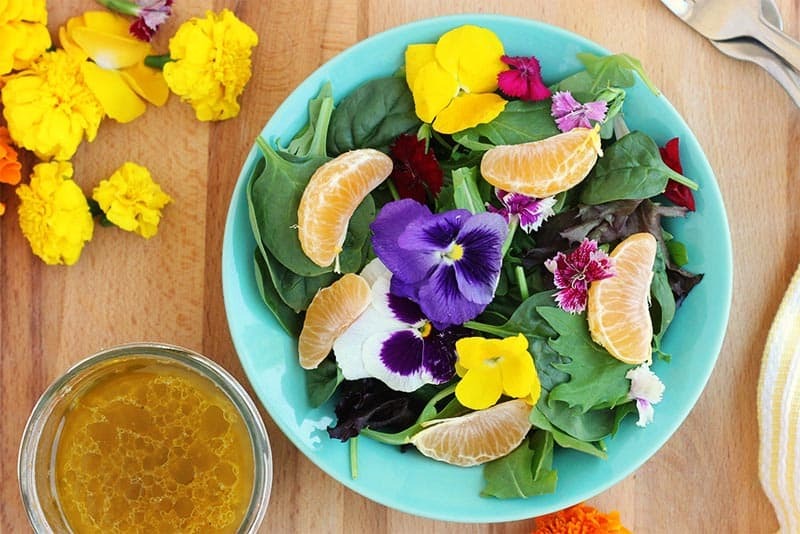 (I know, I know… What food blogger does not know about edible flowers?!) I picked up a bundle and thought I’d educate myself on how/what to serve them with. Come to find out, each variety as a different taste or flavor. The bundle we grabbed pairs well with citrus. Coincidentally, I had just picked up a large bundle of tangerines (anyone interested in a jelly recipe??) and decided… Why not? I reached for my favorite vinaigrette ingredients and quickly got to work. 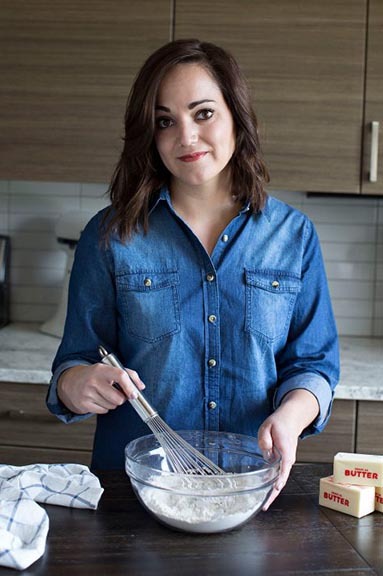 Choosing quality ingredients is always important when you have a simple recipe like this one. 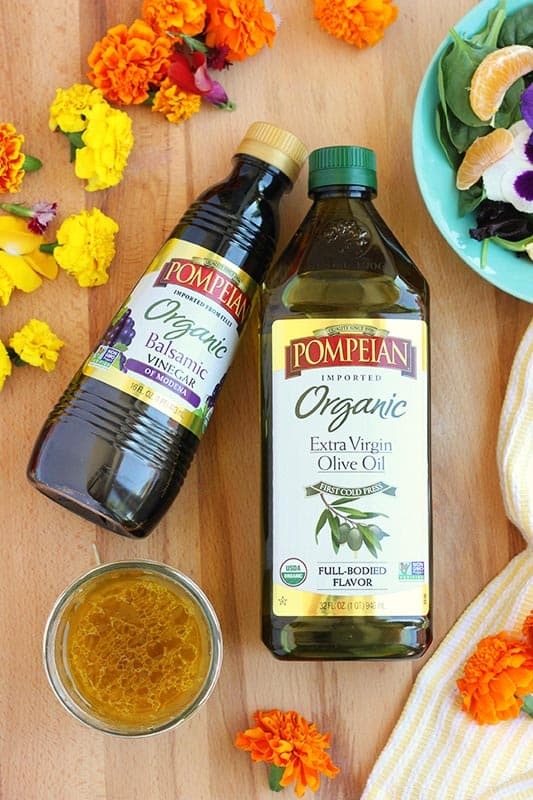 Pompeian’s Organic Extra Virgin Olive Oil is perfect base for dressings, salads and vinaigrettes, or as a table condiment for dipping bread or crudité. The grape juice used in Pompeian’s Organic Balsamic Vinegar is slowly cooked and then placed in barrels for refining and aging which adds a complex flavor. It is also caramel color free and naturally gluten free. Quick side note, we have made this about 6 or 7 times now. It is fantastic on pretty much every type of salad and gives it a fun, fresh, citrus taste. If you can’t find tangerines, a quick substitute would be oranges. They are easily interchangeable and both give a similar flavor. Combine all ingredients in a medium sized mason jar. Secure the lid and shake until combined. Serve on your favorite salad.